Yesterday, the Metropolitan Transportation Authority, the state agency that operates subways, buses, and regional rail in New York City and the surrounding region, announced that a section of the G train in Brooklyn and Queens will be shut down for 12 consecutive weekends this summer while the agency repairs damage caused by Hurricane Sandy last October. (Though my bet is that much of this work needed to be done before the hurricane struck.) Starting Saturday, 6 July, the G’s three northernmost stations—Greenpoint Avenue, 21st Street, and Court Square [Note 1]—will be closed on Saturdays and Sundays while workers repair the Greenpoint Tube, which carries the line under Newtown Creek between the two boroughs. Shuttle buses will replace subway service to these stations during the weekends that the work is carried out. The Greenpoint Avenue station on the G train in Brooklyn, one of the stations that will be affected by this summer’s weekend shutdown of a section of the line. First of all, I applaud the MTA for prioritizing this work and being willing to take so drastic a step as shutting down a section of the G line to carry out repairs. And I’m grateful that the agency has the funds needed to bring this vital piece of infrastructure back to a state of good repair, allowing it to continue to serve in its role of linking New York City’s two biggest boroughs for years to come. It is just these types of bold investments in transit infrastructure that will allow our city to remain economically competitive, vibrant, and growing. But while I acknowledge that this work is necessary, and planning shutdowns over weekends will inconvenience the fewest riders, we’re still talking about thousands of riders who will be affected. 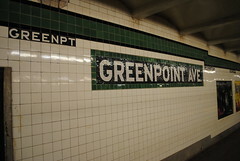 An average of 8,545 people used the Greenpoint Avenue station alone every weekend in 2012. I’ve had to take shuttle buses in place of shut-down sections of subway myself, and I can tell you that it’s no fun. They are invariably crowded, slow, and unreliable. So what can the MTA do to make this replacement shuttle-bus service better? Here are a few suggestions. Use longer buses. Why is it that I never see articulated buses—the “bendy”-type bus with an accordion-like joint in the middle—used for shuttle buses during subway shutdowns? The average New York City bus is around 40 feet (12 meters) in length. Doing a rough calculation, that means at least 7.5 of them are needed to replace a 300-foot (91.5-meter), four-car G train. Running articulated buses, which are around 60 feet (18 meters) in length, every five minutes replaces almost half the capacity of a four-car G train (again, doing a rough calculation)—a lot less crowded and aggravating than a single 40-foot bus every 10 minutes (or less). Stop issuing transfers to subway riders. Seriously, just let people get on the bus. Let them board at every door. And so what if you have a few people who didn’t pay for a subway ride board? You’re probably driving more paying subway riders away than avoiding people who haven’t paid any fare. And those MTA employees who have to stand outside the faregates handing transfers to people—yeah, I’d much rather see them driving a bus (see above) than handing out little blue pieces of newsprint. Listen, I understand the shutdown is going to be an inconvenience for everyone. But this is necessary work, and we straphangers need to do the best we can to deal with it. At least G train riders won’t have to deal with what R train riders are facing: the R train between Brooklyn and Manhattan will be shut down for 14 straight months while repairs are made to damage in the Montague Tube under the East River, which was completely flooded with salt water by Sandy’s storm surge. And with a few simple adjustments to the replacement shuttle service, I think the MTA can do a lot to improve riders’ experience during this time. Only the platform serving the G train at Court Square will be shut down for this work. The other lines that serve Court Square on weekends—the 7 and E—will continue to operate as normal. At least not yet: Metro reports that the MTA plans to shut down the same section of the G train for five straight weeks next summer to continue the repair work.